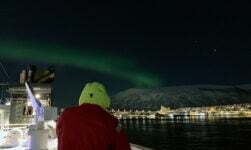 Hurtigruten Diary Day 6: A visit to Norway's North Cape in the polar night. Today's itinerary was built around the stop at Honningsvåg and the trip to Nordkapp, easily the most popular excursion of the trip so far. Last time I was on Magerøya island I thoroughly enjoyed the experience of driving to Nordkapp so I tagged along. How would things be different in the winter? 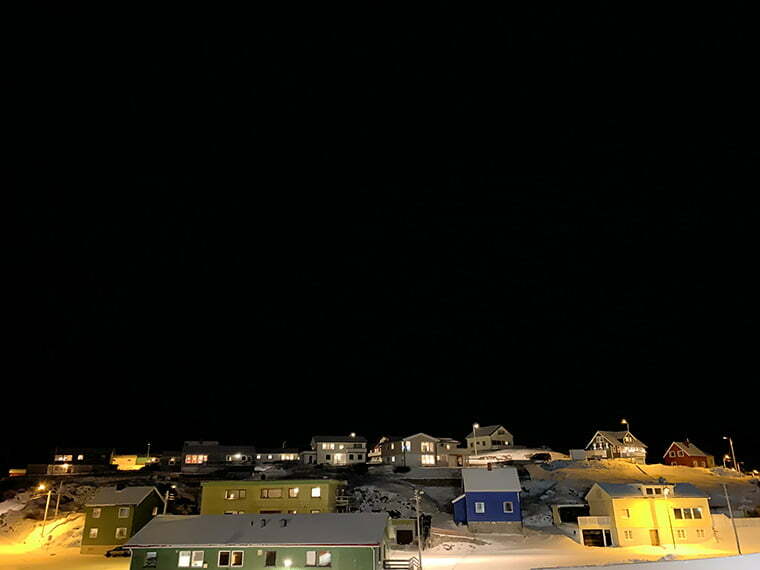 Mealtimes were disrupted because of the 3.5hr stop at Honningsvåg from 11.15am to 2.45pm. In addition to the regular breakfast service, lunch was served from 10.30am to allow guests who were taking the Nordkapp excursion an opportunity to eat first. 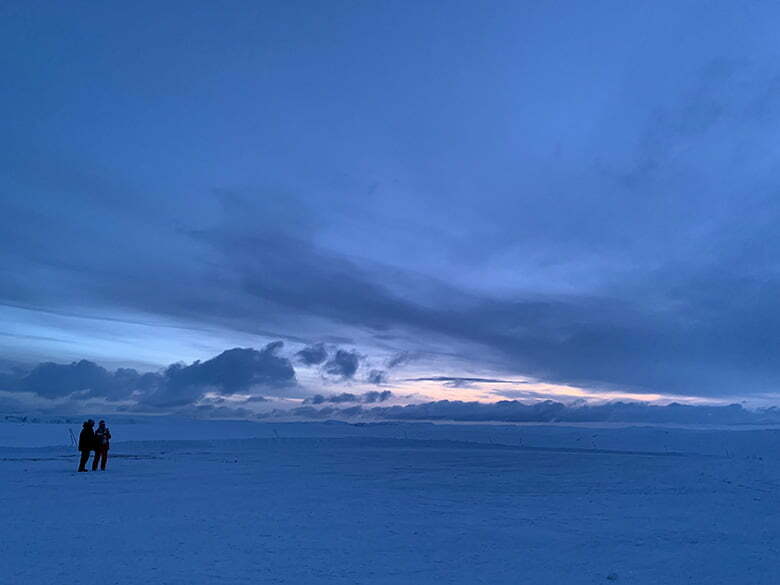 Having visited the North Cape in the summer for the midnight sun, this time around it was the journey there and back through the winter weather that I really wanted to experience. I had expected convoy driving, whereby the road is only open 2-3 times per day at fixed times and the convoy must follow a snowplough. But the guide explained they haven't yet had enough snow to start the convoy. Considering what you see in these pictures, that just goes to show how bad ‘normal' can be in these parts! 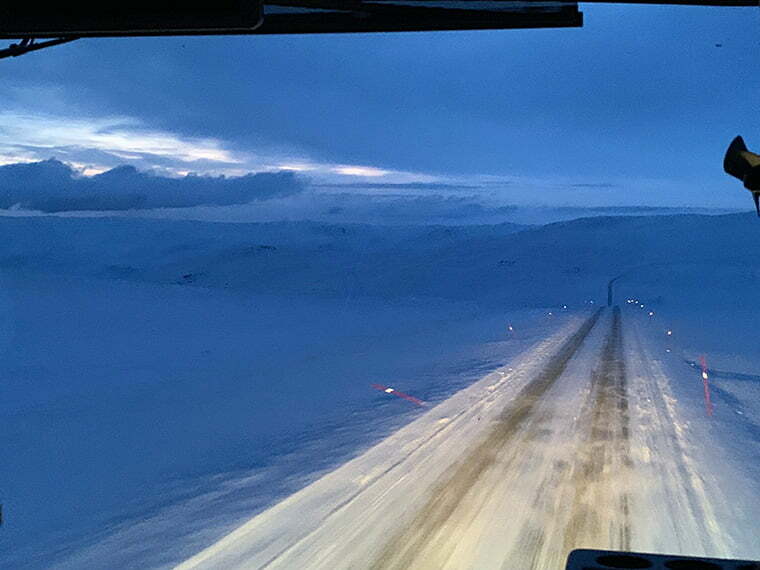 A more usual winter experience is for the snow-plough to clear the road at the head of the convoy, but this practise it starting later and later these days. 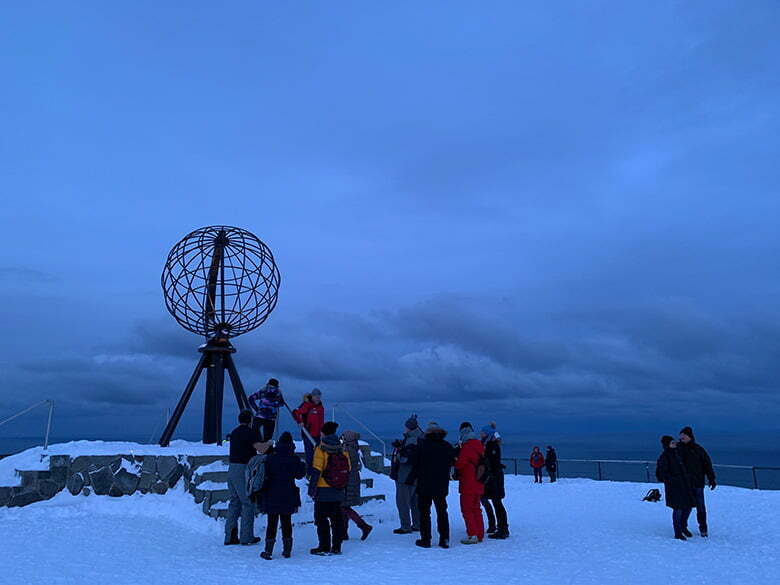 The moment we arrived at Nordkapp was the lightest part of the day so I joined the majority of the group and went straight out on to the plateau for photos. It was around -6C/21F so comfortable enough to be outside for a while before going in to warm up with a coffee and enjoy the exhibitions, the Nordkapp movie and a stroll around the enormous gift shop. Also, I have to mention the guide who was excellent. She spoke fluent English and German, and could speak four other languages too. We got chatting and it turns out she's from the same group of Scottish islands as my mother. Small world! On the bus trip there and back the guide explained when the various roads were built and some interesting facts, such as tourists having to climb up the cliff to reach the cape prior to the road being opened in the 1950s. 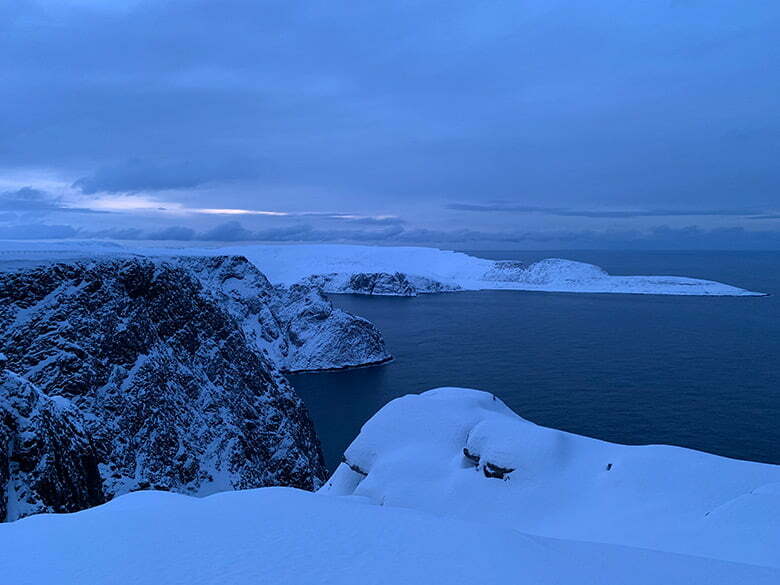 Should you visit Nordkapp in the winter? If you come all this way, it would be shame not to visit as it's such an iconic site, even if it's not technically the northernmost point in Europe. It's a good opportunity to see some raw northern Norwegian landscape on foot and not from the ship. The journey there is the memorable aspect and for me this makes it more interesting to visit now rather than in the summer, especially if your visit won't coincide with the midnight sun. Most people on the bus seemed to really enjoy the experience, most notably the two hardy souls I saw who stripped their clothes for a memorable picture by the globe! Dinner has been excellent most nights so far, but I would say that tonight's offering took things up a notch. 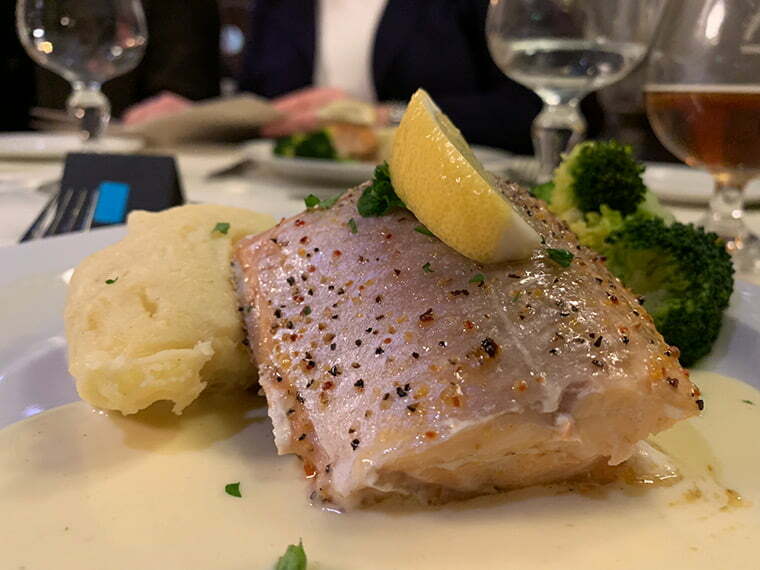 The chef had said earlier in the voyage that the Arctic char was his favourite dish. Everyone on our table thought it was the best dish so far, including me, and many others agreed if my post-dinner conversations in the lounge were anything to go by. The only disappointment at dinner was learning that those who stayed on the boat in Honningsvåg watched the crew practice an evacuation of the ship using the lifeboats. 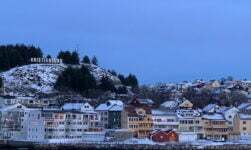 Apparently this happens regularly in Honningsvåg so watch out for it if you choose not to travel to the North Cape! I had wanted to see Mehamn as it's home to the northernmost airport on the Norwegian mainland and it's one of the smallest and most remote ports on the Hurtigruten coastal route. The ship stops for just 15 minutes but that was enough time to take a look from the deck. I have nothing else to say about the port other than: look at how black the sky is! 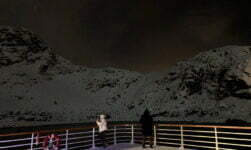 Just outside Berlevåg we had a late-night rendezvous with the Kong Harald, a much bigger ship. The Kong Harald is notorious for hauling its guests out on deck to wave and cheer at the passing ships, and the Vesterålen in particular. It looked as if there were almost 60-70 out on deck with plenty more watching from the lounges. On the Vesterålen we managed a hardy 11 souls, which reflects the demographic of guests on board pretty well! But wait, there's more! 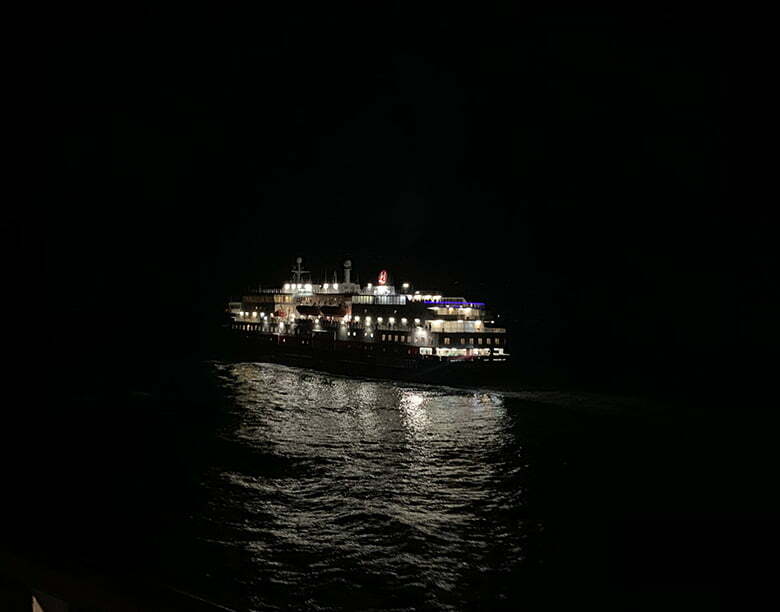 Given they were late leaving Berlevåg which caused us to bob up and down in the ocean for 20 minutes while they sorted themselves out and vacated the harbour, the MS Vesterålen claims a moral victory! 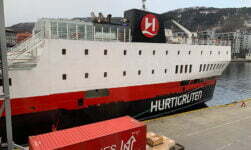 Hurtigruten prides itself on its timing and as the Kong Harald made us late, that gives us the points. Sorry kids! Tomorrow morning we reach Kirkenes, the turnaround point for the coastal voyage, although when looking at the itinerary we are actually a little more than half-way through. That's because there are not many long port calls on the southbound leg. I've also heard that a lot of guests will be departing here with not many joining, so the southbound leg stands to be much quieter. Dinner will now take place at one seating rather than two. It will be interesting to see how this impacts the on-board atmosphere. 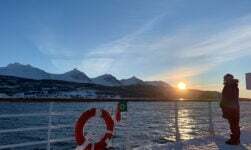 Until then, don't forget to sign up for the book launch notification if you're interesting in hearing more stories from my voyage on the MS Vesterålen! 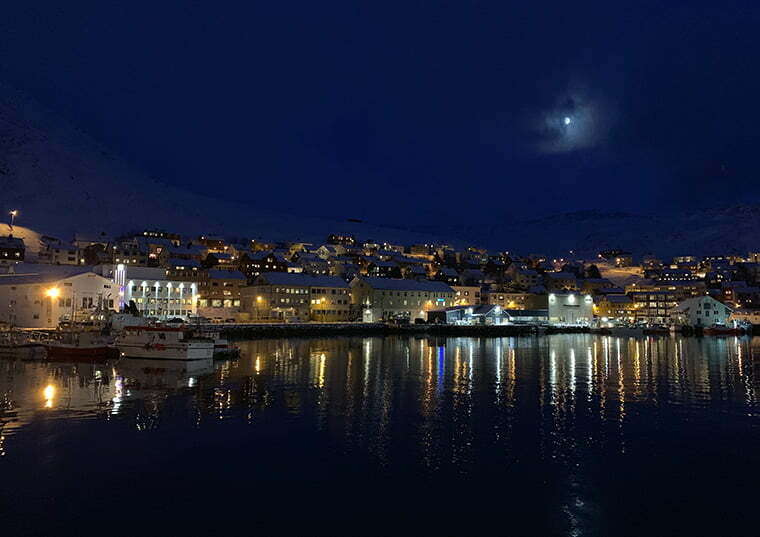 Day 8: Hammerfest & Northern Lights! Fun to follow you on this trip. We took our car with us on the Nordlys back in 2014 and disembarked in Kirkenes. Then drove south through Norway – taking our time – all the way to Oslo. Two days after departing Kirkenes, we spotted our ship again as it departed Sortland. We were in Strand on the opposite shore, waved and took photos. As we still had the ship schedule in our possession, I had noticed almost by chance that our road travel had put us right back on track with the Nordlys!! It was a wonderful time. Cheers. 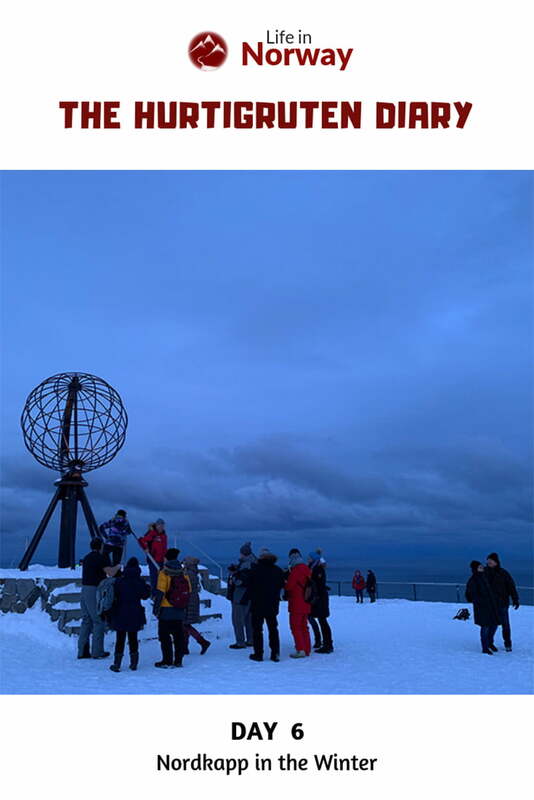 Can you see and photograph the globe on Nordkapp from the boat? I suppose you might be able to during daylight hours and if the weather is clear although you surely need a telephoto lens or binoculars. When we took the trip some years ago I can’t recall looking. It is likely that the ship schedule lists at what time one passes that point (or it might be announced). We took the bus tour. Oops. My mistake. Just took a closer look at Google Earth and no our ship did not pass north of the Nord Kapp back in 2014. So would not be visible. Regrettably impossible. 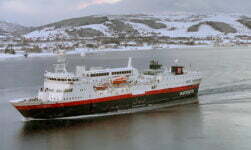 The ships generally remain south of Magerøya whilst sailing from Havøysund to Honningsvåg and further eastbound to Kjøllefjord v.v. As to that they don’t sail north of the North Cape. For myself: my latest (9th!) trip was with the MS Finnmarken earlier this month, with an extended stop at Mehamn on the occasion of New Years Eve. I can confirm that our boat sailed around the south of Magerøya island on the northbound and southbound leg, and not past Nordkapp. It’s a very exposed place and weather can change incredibly fast, so I assume that is the reason. Whether it’s different in summer I don’t know. On our trip, a small group of tourists were just minutes late getting back to the ship in Honningsvåg at departure. The ships don’t wait. It meant they had to arrange taxi to the next stop at Kirkenes to rejoin the ship and their luggage!! Thank you for all of the responses, sounds like the trip is a necessity or copying a photograph! We’ve just booked our trip from Mehamn to Nesna on the Vesterålen, to take us back after the second half of our Norge på langs tandemtour in early July. I’m looking forward to 2 ½ days of relaxation in the midnight sun!